If not for its bucolic surroundings, the cavernous small-monuments room at the Vermont Marble Museum in Proctor might be mistaken for an abandoned urban industrial plant. A grid of worn lumber piers supports a high ceiling. A grappling hook hangs from elevated tracks once used to roll huge blocks of marble from one carving station to the next. A bank of mullioned windows in various states of disrepair runs the length of one wall. White paint crumbles from every surface. The empty room is a perfect spot, in other words, for evoking the despair and desperation of a descent into Hades. That's what Quincy and Jeff Bruckerhoff had in mind when they decided to stage Ricky Ian Gordon's contemporary opera Orpheus and Euridice there. 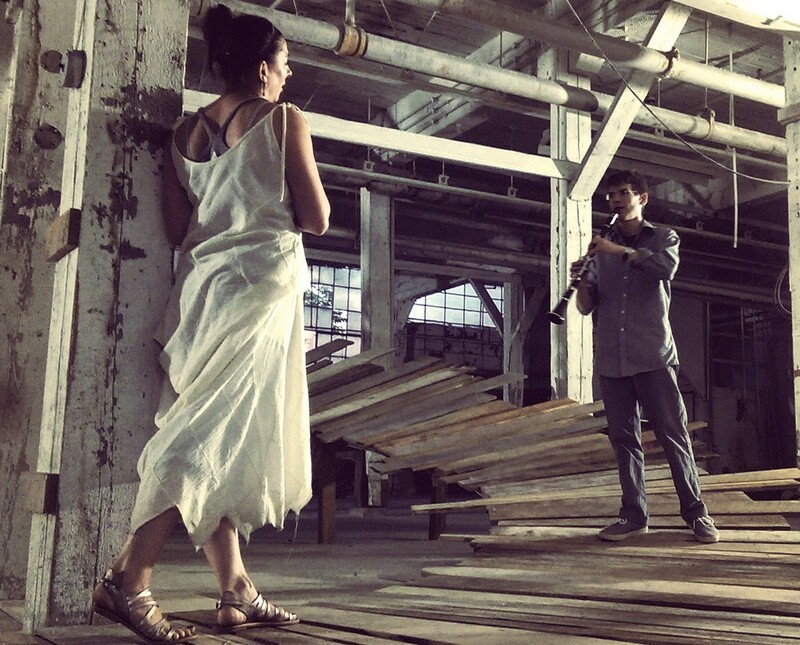 The hourlong opera, which premiered in 2005, will receive two performances in the former manufacturing space this weekend. Actually, when the Bruckerhoffs founded the Vermont Opera Project out of their Clarendon Springs home 18 months ago, they envisioned staging their first production in the museum's disused quarry. Later, when realities such as the possibility of rain set in, they opted for the gritty interior of the small-monuments room. It may be the most interesting opera venue ever used in Vermont. The Bruckerhoffs, who moved to the Rutland area from Washington, D.C., with their two children in 2011, are clearly fearless. For one thing, new opera companies in Vermont are a gamble. While the Opera Company of Middlebury is doing well, the ghosts of the Burlington-based company f y d o (Fresh Young Dynamic Opera) and the more recently discontinued Green Mountain Opera Festival still roam. Even the children's company, Opera Theatre of Weston, is in "limbo," according to its directors. Asked during a phone call why the Bruckerhoffs wanted to start a new opera company in Vermont, Quincy jokes, "Besides that we're, like, slightly insane?" That, and they have significant combined experience in the theater and opera worlds. Quincy, who is VTOP's general director, trained in voice but began stage managing after college, after discovering she had stage fright. She worked at Sarasota Opera and Washington National Opera, among a host of major companies. Since 2008, she has represented musicians, singers and dancers through her agency Quarterline Design Management. Jeff specializes in lighting design and is VTOP's managing director. He has worked at the Kentucky, San Francisco and Washington National operas. Originally from the Rutland area, he has also designed lighting for Vermont's Dorset Theatre Festival and Weston Playhouse. Jeff is doing Orpheus' lighting using equipment donated by the Paramount Theatre in Rutland, and he built the economical but effective set. Audiences will access their seats via a long hallway, lined on one side by dusty storage space. About 250 chairs will be set up among the piers. As Seven Days approached a recent rehearsal, the emotion-laden voice of Tinmouth soprano Suzanne Kantorski, who sings Euridice, echoed down the passage. Kantorski, who has also appeared in Opera Company of Middlebury productions, stood on a spiraling path made of irregular wooden planks that sweeps around the floor and then tilts upward, ending in a surreally vertical position halfway up a pier. It's a perfect visual representation of the plot of the Orpheus myth, whose protagonist, a lute player, must lead his beloved Euridice out of Hades without looking back at her. This he fails to do, losing her forever. In New York City-based composer Gordon's version, Orpheus is a clarinetist whose voice is his instrument; he acts out the part while playing. Euridice doubles as narrator, and four dancers — a kind of Greek chorus of Furies — elaborate the story as she sings it. Instead of being killed by an asp, as in the myth, this Euridice fades away incrementally. Gordon wrote the libretto in a flash one night in 1995, as his partner was dying of AIDS. Originally conceived as a song cycle for soprano, clarinet and piano, the work included eight dancers at its 2005 premiere, at the Rose Theater at Lincoln Center as part of the "Great Performers" and "American Songbook" series. A New York Magazine reviewer called the performance "magical." A 2008 performance by Long Beach Opera, which can be viewed on YouTube, was staged in an indoor pool with Orpheus standing in a floating dinghy. When Wesley Christensen, who plays Orpheus, saw that last version, he "thought it was pretty crazy," he says by phone. But the Waterbury clarinetist has since embraced his role, which entails interacting with the dancers while playing his instrument. "In one scene, I'm lying down and playing, then jumping up on blocks. You're not playing a concerto standing in one spot on the stage," he says — as he's done with the Champlain Philharmonic. Christensen, an insurance salesman by day, has also played with numerous Vermont orchestras and teaches at the Monteverdi Music School. A string quintet sourced from the Vermont Symphony Orchestra will accompany performances. Christensen judges the music "very lyrical even though it's modern," with echoes of Leonard Bernstein and Aaron Copland. The award-winning Gordon has written operas for Stephanie Blythe (27, about Gertrude Stein) and Frederica von Stade (A Coffin in Egypt), and has also composed for Nathan Lane, Kelli O'Hara and other Broadway stars. VTOP will reprise Orpheus in another interesting venue on September 10 and 11: the National Gallery of Art in Washington, D.C., which is underwriting those performances. Local opera buffs can look forward to more than just Orpheus and Euridice. VTOP's stated mission is to stage site-specific productions of new and rarely performed operas — including, eventually, William Bolcom's A View From the Bridge, a major work involving multiple soloists, a chorus and an orchestra. Perhaps a covered bridge for that one? The original print version of this article was headlined "Vermont Opera Project Revisits the Orpheus Myth in Marble Museum"